Make a wish and build a perfect day at the palace! Favorite genies-in-training from Shimmer and Shine. Each playset features a magical surprise! Case contains 6 individually packaged playsets. Make a wish and build a perfect day at the palace with your favorite genies-in-training from Shimmer and Shine! They're getting ready for a dazzling day in Zahramay Falls, but they need help putting the finishing touches on their plans. Your little genies can help when they build these palace playsets and make a wish for a magical surprise! 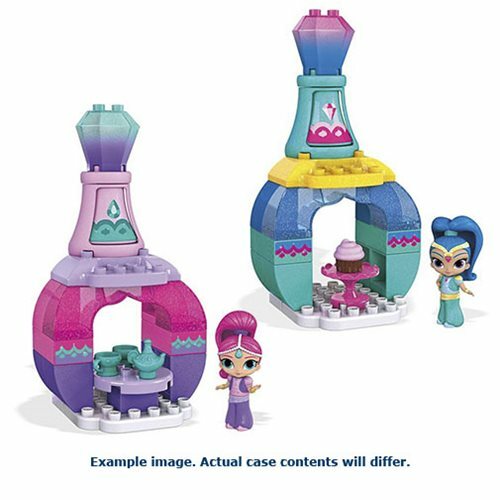 Each Mega Bloks Shimmer and Shine Palace Playset includes one character with themed, buildable pieces. Characters, themes, and details may vary. Contains 22 pieces. Ages 3 and up.